- 5 minutes by foot to appia antica's park knew as one of the biggest and acient archeological site of rome with the possibility to visit the famous "catacombe di domitilla, s.sebastiano ecc...). - fast link to the centre of rome by public transports quick acces by metro line "A" (Colosseum, Spagna and barberini one) easly linked to the accomodation by 3 bus lines (50m) (the bus travel takes about 5 minutes). "We want to thank to Marina and Roberto for their Italian warm hospitality and help, they tried to make our staying more comfortable. Good taste, nice house, a place, that made with love! Surrounding is great, we were pleasantly surprised! We would recommend this house to anyone and would love to come back again, thank you, Roberto for our suitcase!!! Gennadii and Irina from Kiev, Ukraine"
"Super gospodarze, mili i pomocni. Przystanek 50m od domu, dogodny dojazd do centrum. Obok winiarnia, sklep z kawa, piekarnia z cieplymi buleczkami. Nieopodal supermarket, bary i restauracje. Mieszkanie w pelni wyposazone, z dostepem do internetu. Swietna atmosfera. It was really great week at Rome. This place is well located, nice, clean. 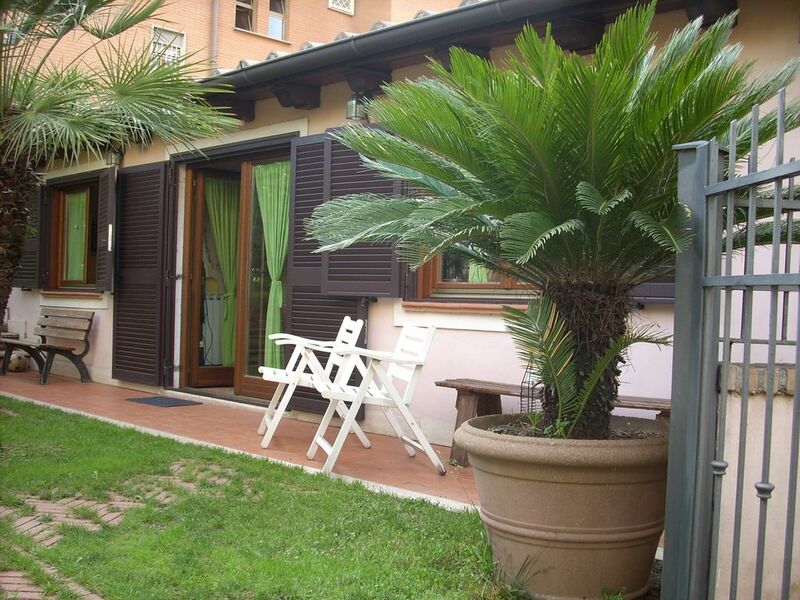 There is internet access, nearby is bakery, wine and coffe shop, supermarket, bus stop about 50m from flat. "Marina and family were very kind and helpful but not intrusive. The little house is lovely and clean and well set out. The location is fine and we wouldn''t hesitate to stay here again. Once you get used to the transport system you find there are quite alot of options for getting in and around different parts of Rome from the house. Transport is frequent. The Caffarella Valley is not far away and is beautiful, Appia Antica is about 20 minutes walk and this is the nicest section of the way, the aquaduct remains are just over the road. Supermarket, bakery, wine sold cheaply by the litre just round the corner. No problems with noise." "accommodation was clean bright comfortable and cheerful. It is a small flat but has everything you need. DIdn't mind the travel into Rome once we had sussed out the buses (especially check with the family where to get off on the return journey) - made us feel like we were commuters rather than tourists! Absolutely the best thing about the location of the flat is the proximity to the Via Antigua. This is one experience that is not well documented in the guide books and yet is so special-an unforgettable memory. Not so keen on the Via Nuova. The family were fantastic hosts." "The house is described perfectly in its write-up. It is very comfortable,spotless,homey,private,and filled with all the amenities you could want. What the description does not state is how kind and helpful Marina and Roberto are. We arrived to find soda and sparkling water in the fridge and a bag of yummy cookies to tide us over until we were able to go to the grocery store which was almost immediately across the street from us. There is also an incredible bakery as you exit the gate of the house. Roberto went out of his way to help us figure out the metro/bus system and the ticket machines. The bus system runs often and can be picked up right across the street from the house. Getting to the city of Rome takes a bus and a metro ride but it goes very quickly. The home is located at a perfect distance from the city and gives you a nice breather from the hustle and bustle of Rome, the city. Appia Antica is a couple bus stops away in the opposite direction and makes a wonderful day trip. All in all, our stay could not have been more perfect." "The place is very beautiful andthe owners are very kind. It was a cosy stay. The only inconvinience was getting to the city and back - takes about 15-30 mins, but we were aware of this whe we rented the house." 1)Ciampino Airport 5 km far. 2)acces by metro line "A" from termini's station (stops: "arco del travertino" or "colli albani") and 5 minutes by bus (663, 664, 765). 3)By car: possibility to choose among two motorways: Rome-Florence or Rome-Naples connected to "grande raccordo anulare" of rome. Tariffe in funzione del numero di persone, Richiesto supplemento per il riscaldamento in base alla stagione, Caparra richiesta alla prenotazione, Consegna delle chiavi da parte del Proprietario presente in loco.